Is it possible to reverse your type 2 diabetes? We know that type 2 diabetes is a progressive disease. When we put on weight, our fat cells (the body’s main ‘fuel’ storage facility) reach a point where they become full, and are almost at bursting point. They basically shutdown their ability to store more fat, and become ‘distressed’ and resistant to the hormone insulin. This puts a strain on the pancreas to produce even more insulin, trying to force our fat cells to work. Eventually, the pancreas wears out, and is unable to produce adequate insulin to control blood glucose levels, causing blood glucose levels to rise. Sooner or later, this ultimately leads to a diagnosis of type 2 diabetes. 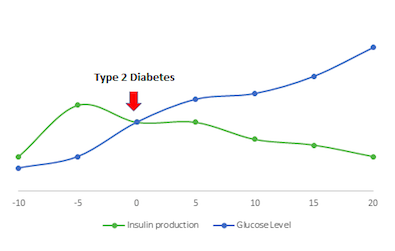 Because diabetes is a progressive disease it’s important to think about it on a continuum of 30 years or so. You might be in your 40s or 50s and put on a little weight around the tummy. This extra fat starts to fill fat cells. Putting pressure on the pancreas to produce adequate insulin, in order to deal with the increased demands for sugar to be stored as fat. This increase in demand for insulin is known as insulin resistance, or prediabetes. Your GP can test for pre-diabetes by measuring your insulin and blood glucose levels using an oral glucose tolerance test. So if you think you might be at risk, it’s worth asking for. Usually, the point of diagnosis, where insulin production can no longer match blood glucose levels, and blood glucose levels start to rise. Blood glucose levels are easily detected via a blood test that can be ordered by your doctor. You may need to take medications, or change your lifestyle to increase exercise and reduce your meal portions. As diabetes progresses more medications or insulin may be required to help manage blood sugar levels. This is important in order to reduce risk of complication such as stroke and heart attack. 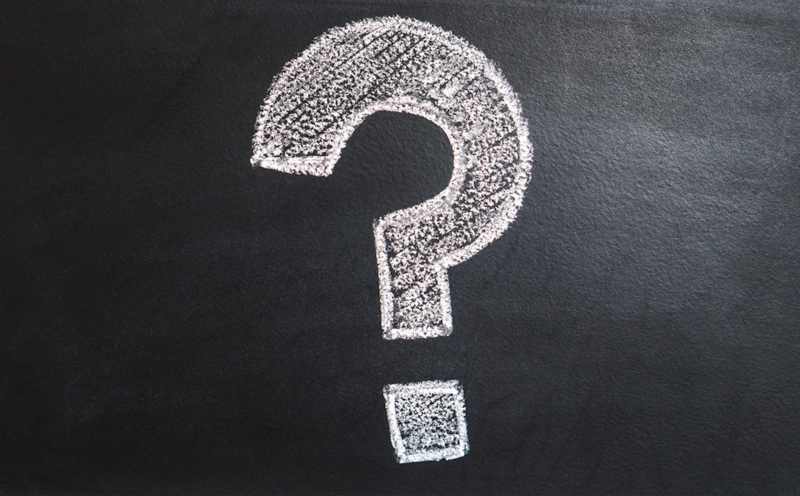 So how do I change my diabetes fate? Depending on a person’s genetics, weight, motivation and activity levels, if caught early enough, insulin resistance can be improved, and, the progression of rising blood glucose levels can be slowed. So, ‘reversing’ is probably not be the best description for most people, ‘slowing the progression’ or a ‘diabetes hiatus’ might be more apt. If we can slow the progression enough, we may actually be able to halt type 2 completely for many years. How can I slow down diabetes? Unfortunately, you’ve heard it before…. improving the quality and reduce the quantity of the food we eat is the first step. Ensuring you are active regularly is also important. If you are overweight, particularly if you carry you weight around your middle, a weight reduction will help to slow the process. That really depends on you and your body type. Current guidelines recommend a waist circumference less than 80cm (32inches) for females and 90cm (36 inches) for males. However, even small amounts 5- 10% of your body weight can make a big difference! There are certain medications, particular ways of eating and psychological support that may all help slow, halt or even trickle back diabetes progression. Your doctor and diabetes team can help you to explore all of these options and develop a plan that’s right for you. No matter which stage of diabetes (or prediabetes) you’re at, small (or maybe big) changes can slow down its progression. Lifestyle changes may reduce the number of medications your doctor prescribes in the long term, and hopefully, allow you to live a long and healthy life. 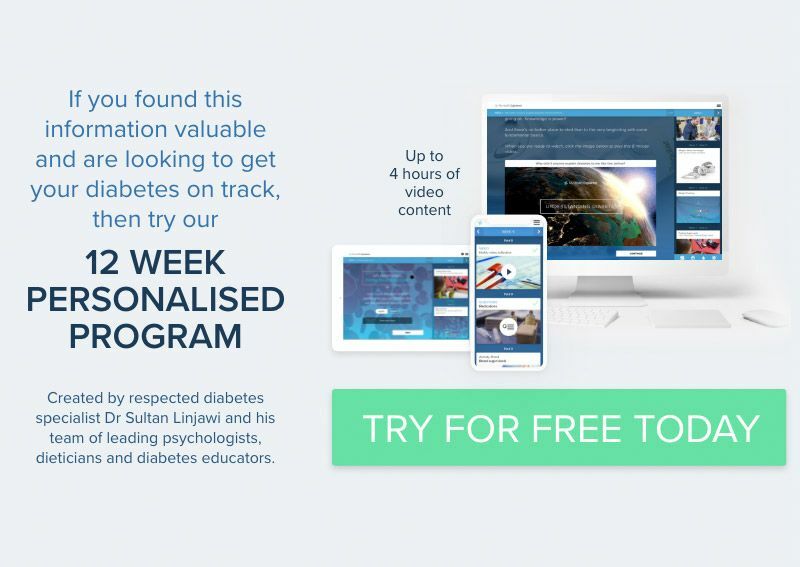 If you have already been diagnosed with diabetes and would like to know more about how best to manage the condition, you can join or explore our personalised 12 week diabetes program. The first week is free!